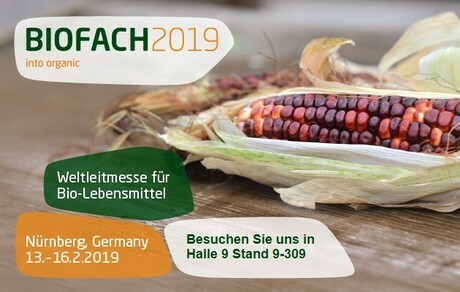 The BioFach exhibition in Nuremberg is imminent and exhibitors and visitors are preparing for these exciting days for the organic sector. Steffen Mucha, Managin g Director of ÖBS GmbH, also has great expectations for the event: "The fair is an opportunity for us to meet our customers in person. We want to make new contacts and cultivate existing ones; it will be three very intensive days for us, on which we will then base the entire coming year is. Personal contact with customers and suppliers is very important to us." The dry summer of 2018 has bothered many growers, but it has often been said that bio-production was better off in the end. "The mood is generally good. We did not have an easy production year in 2018 either, vis-a-vis the difficult weather conditions, but the advantage was that on average, organic farmers often had more extensive irrigation systems than conventional farms, so they could stabilize yields sufficiently, albeit at a higher cost." Apart from irrigation, the weather had an impact on quality and quantity, Mucha said. "There is, nevertheless, security of supply. We are able to supply our customers, as before, until the spring." The prices for both potatoes and onions are stable, although there are certain risks: "It is difficult to predict how the tubers will develop in storage, but so far there are no problems." Some of the farmers have recently invested in cold storage, which also has a positive effect on the quality of stored goods, Mucha said. The development of the organic sector in the German market is good, says the managing director. "The trade is currently promoting 'Bio' very strongly. It can almost be said that discounters want to outdo each other only with organic products. We expect a lot from this, as we can see further expansion of the organic markets - which we can certainly cover." The planning for the coming season is already in full swing. "We are already talking to our customers about aspects such as acreage and varieties." With regard to varieties; the trade is currently increasingly looking for hard-boiled potatoes and the ÖBS is following suit. "For cultivation, we are also interested in factors such as storage stability and yield security." The ÖBS has been marketing exclusively ecological products for 25 years. "Our specialty is the direct delivery of goods from the producer to the customer. Anyone who buys from ÖBS, buys directly from the grower, just with the full package of our organization's services." The organization specializes in cereals, legumes, oilseeds and, secondarily, vegetables: "Here we focus on the contract cultivation of vegetables for processing, for freezing and baby food, as well as potatoes and onions for the fresh market." Would you like to get to know Steffen Mucha and the ÖBS in person? Visit them at their stand at the BioFach: Hall 9, Booth 9-309.